After my paella dinner this weekend - Juan's Paella + Carigane Rosé - I still had leftover ingredients. I had initially planned to make two pans of paella, but both pans did not fit on the stovetop at the same time. So, I decided to do an encore dinner with a slight change: I used cuttlefish ink for a black version. Please note that this is not wholly traditional; I didn't use any squid, for example. But it was so delicious that I wanted to share what I made! Allioli, akin to the French Aioli, is an incredibly versatile sauce or emulsion that's ubiquitous across Spain. It's eaten with fish, meat, and vegetables and is traditionally made with a mortar and pestle. My version is made in the food processor, but it's still as rich and creamy. Put garlic and salt in a food processor fitted with a metal blade, or in a blender. Pulse 2 or 3 times. Add the egg yolk and lemon juice. Pulse until blended. Turn the food processor on low and add the olive oil in a thin stream through the access chute. If it becomes too thick, thin it out with some water and continue streaming in the oil until it's all used. Spoon the allioli into a small bowl and refrigerate until ready to use. 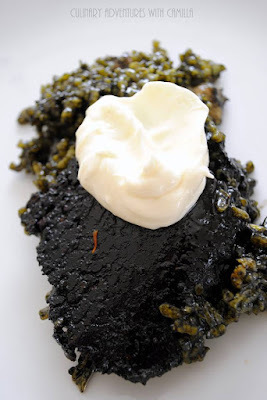 My friends who taught me how to make paella had told us about the black paella that's made with seafood and squid ink. We love it! +Juan used this and they brought some back from Spain for me, so I use it. But, in a pinch, you can add a blend of paprika, pepper, and clove to the pot. These packets also include a food coloring that makes regular paella a rich golden color. 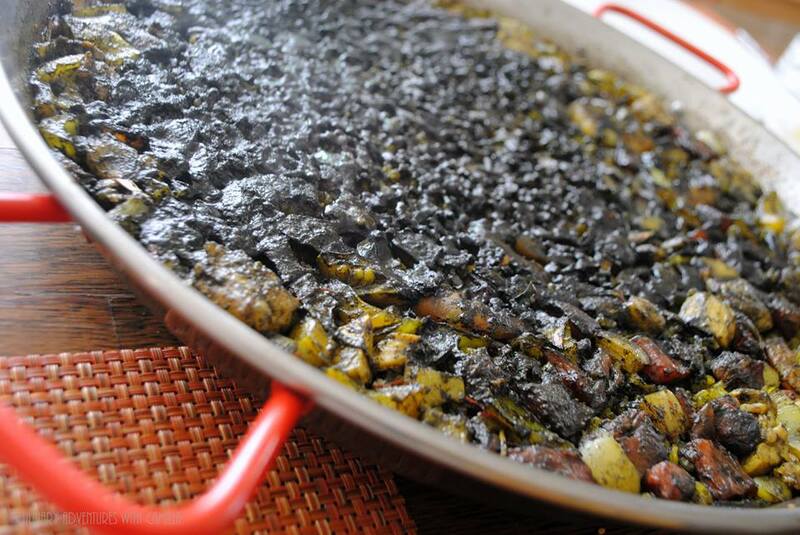 For this black paella, the food coloring isn't so crucial. Heat olive oil in the paella pan. Cook the chicken through. Stir in the garlic. Add onions and bell pepper. Sauté until the onion is softened and translucent. Add in the tomatoes and cook until they have lost their shape slightly, approximately 6 to 7 minutes. Sprinkle the seasoning packet into the pot and add the saffron to the side so it's not where the heat is most concentrated. Stir in the cuttlefish ink so it's spread throughout the pan. Tip in the rice. Arrange the shrimp so they are in a single layer, nestled into the rice. Pour in the stock. At this point, do not stir. Gently shake the pan to distribute the rice and seafood evenly. But do not stir. Ever. As Juan instructed me: "This is not risotto." When you no longer see any bubbles, remove the pan from the heat. Tent it with foil and let it steam for 10 minutes. Serve with a dollop of allioli on top and more on the side. Earlier this year I had a friend from Spain teach me how to make paella. 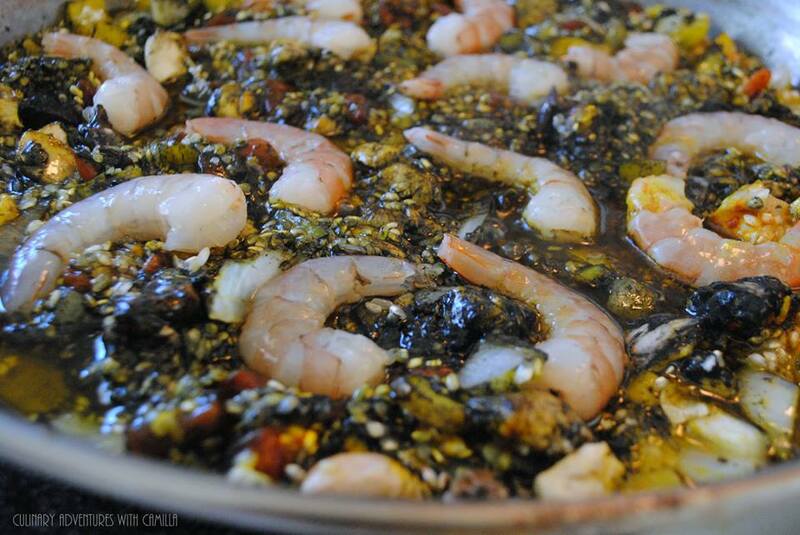 Real paella. And, since then, I've made peace with my paella pan - it was previously collecting dust in the garage - and whipped up some really tasty dinners. Tonight, I had some friends over. I made paella, they took care of the salad, wine, kids' drinks, and dessert. Quite a deal for me! +Juan used this and they brought some back from Spain for me, so I use it. But, in a pinch, you can add a blend of paprika, pepper, and clove to the pot. These packets also include a food coloring that makes regular paella a rich golden color. Peel and dice the onions. Deseed and dice the bell pepper. I love my son's solution for his eyes while chopping onions: his snorkeling mask. No tears! Sprinkle the seasoning packet into the pot and add the saffron to the side so it's not where the heat is most concentrated. Tip in the rice. Pour in the stock. At this point, do not stir. Gently shake the pan to distribute the rice and seafood evenly. But do not stir. Ever. As Juan instructed me: "This is not risotto." Denise brought over a bottle of 2013 Carignane Rosé from River Run Winery. Carignane (Cariñena in Spain) is a black-skinned wine grape variety, most likely native to northern Spain, specifically the town of Carinena. Great pick! This was a new-to-me wine and I loved it! The Carignane grapevines for this wine are over 90 years old. This is a crisp rosé with delightful heft. 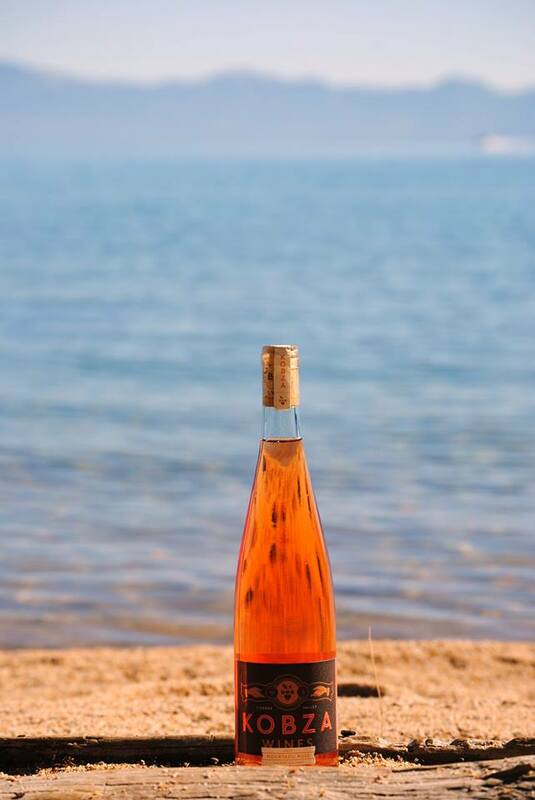 A medium pink color, this rosé reveals aromas of citrus along with a hint of floral fragrance. On the tongue, I got flavors ripe strawberries, pink grapefruit, and watermelon. The sweetness is coupled with a dry composition and finishes with a bright acidity. It was a great wine for the paella. Today we're celebrating National Blueberry Month. 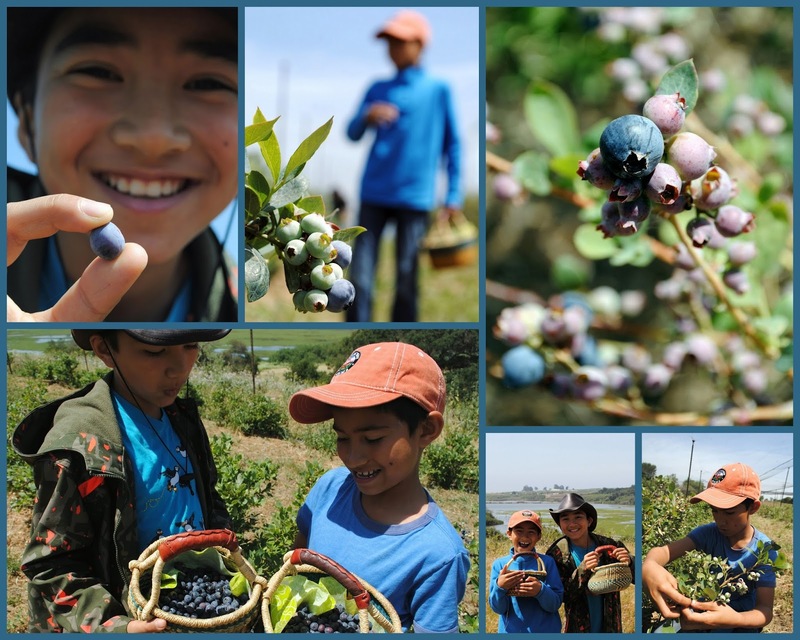 Wendy at A Day in the Life on the Farm asked us to join her in posting a new blueberry recipe and celebrating these lovelies. Done. A few years ago, the boys and I went to High Ground Organics' Harkins Slough Farm to pick blueberries. We didn't make it back there this year, but we still talk about that experience. I find myself making panna cotta frequently. Probably because it's flexible. I've made Espresso Panna Cotta, Cardamom Panna Cotta, Salted Juniper-Dark Chocolate Panna Cotta, and Matcha Panna Cotta. It's so easy to get creative. So, I figured it would be a good starting point for a blueberry dessert. When I brainstormed with my Kitchen Elves, they came up with goat cheese and blueberries. Yep, I agree. They might have been joking, but I wasn't. In a small bowl, sprinkle gelatin over cold water and let stand for 5 minutes to soften. Heat half-n-half and sugar in a saucepan over medium heat. Stir occasionally, until sugar is dissolved and mixture just begins to steam. Remove from heat and whisk in goat cheese, stirring until smooth. Stir in softened gelatin and vanilla paste until completely incorporated. Stir in lemon extract. Divide into your individual containers, cover, and refrigerate until set - at least 4 hours. I usually leave mine overnight. Stir balsamic vinegar and honey together in a small saucepan and place over high heat. Bring to a boil. Reduce heat to low and simmer until the vinegar mixture has reduced to 1/3 cup, approximately 10 minutes. Set the balsamic reduction aside to cool. Stir blueberries into balsamic reduction until nicely coated. Spoon balsamic blueberries over panna cotta and serve immediately. There are several things I consider musts on camping trips: my stovetop espresso maker, my little butane burner, a corkscrew, good wine, and a hammock. What I don't bring: wineglasses. Sorry. You'll just have to deal with my stainless vessels. Well, this was our first year with a hammock and I cannot imagine why I've never brought one before! I'll never leave home without one now. I brought along a bottle of Joseph's Blend Le Mistral. I uncorked it with a plate of polenta and fresh corn topped with an egg simmered in tomato sauce. Delicious camping dinner! The name, Le Mistral, comes from the name for the winds of the Rhône Valley in France. Similar winds here cool the vineyards, producing grapes similar to the Syrahs and Grenaches of the Rhône. This wine was beautifully complex. With a lively palate, I got bright evergreen notes softened with smoky, sensuous vanilla. It finishes with smooth cocoa notes. I can imagine this with a grilled steak or lamb lollipops. I'll have try that out soon. There are certain thing we always have when we're camping. S'mores are one of those. A few years ago, I even served S'mores for Breakfast. This year, on the last day of the trip, we had to use all the firewood...and eat all the s'mores ingredients. "Mom, we have to make all the s'mores. You never let us have s'mores at home." True. The boys decided to try a variation that their friend Trinity had made during one of our Halloween camping trips: marshmallows (roasted or not), dipped in melted chocolate, and rolled in crushed graham crackers. So, they called it 'The Trinity' - named for their friend...and because it's the holy trinity of camping foods. Here's the original! Her dad sent this to me! My boys fashioned a double boiler and melted the chocolate! This isn't so much a precise recipe as a process. Place crushed graham crackers in a shallow bowl for easy rolling. Melt chocolate in the double boiler. Keep warm. 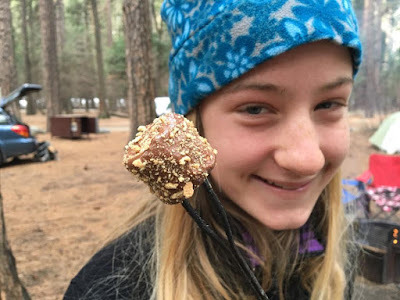 Toast marshmallows - or not. Roll marshmallows in chocolate. Dip in graham crackers. Eat immediately! You can see our variations. I dipped one side only; D dipped both ends; and R covered every bit of the marshmallow. Jake just waited by the fire to "test" all of our creations. What fun! 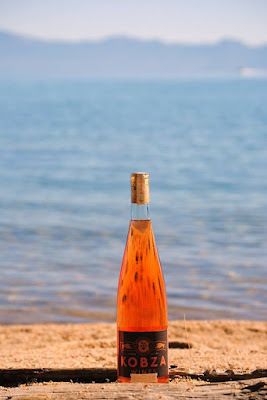 When I was looking for a good Rosé to take camping, I stumbled across Mourtaou Cienega Valley Rosé Blend 2015 by Kobza Wines, at Whole Foods, and picked up a few bottles for the trip. Yum! No wine pairing, just the wine, a book, and a great view of Lake Tahoe. Cheers. I spoke to Ryan Kobza years ago. Then, he wasn't making his own wines. So, I was doubly excited to give these a try. Ryan has a thing for ancient vines, as in more than a century old. Additionally, this wine is made from an obscure French grape called "Mourtaou." Old and obscure...that's my kinda wine. My first rule for a Rosé is that it must be charming, but charming in the je ne sais quoi way - the sly, sideways glance kinda charming - not the Disney Prince kinda charming. This one hits charming out the park. It has an impressive earthiness with a subtle acidity. The notes of tart grapefruit and honeyed peach shockingly do not compete; instead they meld seamlessly for a complex flavor profile that pleases from beginning to the end. It's curvy, fresh, and quickly cemented itself as one of my favorite summer sips. This is a sponsored post written by me on behalf of Bush's Best Beans in conjunction with The Women Bloggers, LLC. When I was in college, beans and rice were a pantry staple. Together they were a complete protein. But, most importantly for a student budget, they were affordable, filling, and tasty. When my eldest son was a toddler, he would often turn his little nose away from something he had devoured the day before; but I could always count on him to eat rice and beans. To this day, when he sees a dish with beans in them, he does a happy dance and always asks for seconds...and sometimes thirds. So, when the opportunity arose for me to create a recipe using Bush's Best Beans, I was excited. Not only are beans a family favorite, I love that they are high in fiber and protein. And with all the varieties of beans, they are incredibly versatile. While I often cook dry beans from scratch all day in a Dutch oven, that's not always convenient - especially if I forgot to soak them the night before. So, I stock canned beans in the pantry, too. Canned beans are great to have on-hand for quick, easy meals. And, even better: canned beans are not a specialty item. 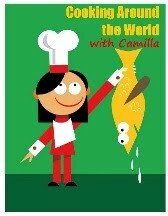 They are readily available in every grocery store and most convenience stories. Use their product locator to find whatever Bush's Beans you need: here. I love that Walmart carries them, too! I picked up multiple cans of Bush's Black Beans, Pinto Beans, and Garbanzo Beans and even taste-tested the difference between the Reduced Sodium and the regular versions of those as well. Then I set to work developing different recipes with beans. But, hands down, the recipe my family voted for me to share - Chimichurri Pinto Beans & Roots Soft Tacos. 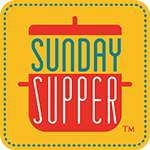 It's a great meatless Monday option and something that we've made several times in recent weeks. You can make all of the components ahead of time and just heat what you need for a speedy dinner. By 'roots', in this instance, I used carrots, potatoes, and onions. But, in other versions, I've tried this same recipe with beets and celery root. It's a flexible process that's easily adaptable for whatever you might have on-hand. Get creative! For me, it's the chimichurri that makes these soft tacos unique. If you're unfamiliar, chimichurri is an essential part of Argentinean cuisine; it's not an exaggeration to say that there's probably a bowl of chimichurri to be found on every Argentinian dinner table. It's delicious and incredibly easy to make. Chimichurri is typically served with steak, but it's also great on other proteins. And with the addition of lots of fresh herbs, the flavor is incredible. Chimichurri kicks up beans more than a few notches. In the bowl of a food processor, combine all of the ingredients except the olive oil, salt, and pepper. Process until smooth, drizzling in the oil until desired texture; season to taste with salt and pepper. Transfer to a bowl and let stand for, at least 30 minutes. If you are making this ahead of time, place in a lidded jar and keep in the refrigerator. Before serving, add the beans to the chimichurri and stir until well-combined. Pre-heat oven to 400˚F. Place the carrots, potatoes, onions, garlic, and spices in a large mixing bowl. Toss to coat with olive oil and spread into a single layer on a parchment-lined or silicone sheet-lined tray. Roast until tender and browned, approximately 30 to 40 minutes. Heat the tortillas quickly over an open flame or in a pan. Assemble the tacos with a layer of roasted roots bean mixture. Top with the chimichurri beans. Add some crumbled cheese - and extra chimichurri as desired. We like a variety of salsas. I usually offer a salsa fresca, a roasted salsa, and - sometimes - pickled red onions. Do you have a favorite way to use beans? And, do you have a great meatless taco idea? I'd love to hear it! *Disclosure: I received compensation for recipe development and generating social media traction. My opinions do not necessarily reflect the opinions of The Women Bloggers, LLC, or the manufacturer of this product.